Cloud based solutions have become very attractive to businesses in the past few years – with lower upfront costs, a reduced infrastructure requirement and less maintenance, it is no surprise that their is huge growth in the cloud sector. However, businesses, both enterprise and SMB’s need to be aware that although there are instances where cloud is best, some on-premise solutions can also be more beneficial long term. There is no one solution fits all model. Some organisations may benefit from pushing all their communications into the cloud. Some may need a private, secure & in-house solution. Some may need a hybrid of both, with connectivity between the private and public worlds. There may be confusion over which way to go, and companies need to be weary not to fall into a biased trap. As both a cloud and on-premise integrator, VideoCentric can help you to move in the right direction, whether towards the cloud or not. SO WHY ARE BUSINESSES MOVING TO THE CLOUD? Whilst Video Conferencing has become a vital part of many organisations, there are numerous challenges faced with traditional on-premise solutions, that can be overcome by moving to the cloud. Historically, many video conferencing solutions have had difficulty communicating with other video conferencing solutions, due to manufacturer differences, protocols (SIP/H.323), age and current network infrastructure set up. Many Cloud solutions such as Cloud Based Virtual Meeting Rooms can provide the interoperability between different protocols, with the software instantly upgrading as new inteoperability features are released, allowing everyone to communicate, whatever system or device they are using. Video Conferencing has traditionally been confined to internal networks, with infrastructure deployed securely behind firewalls, and external firewall permissions only opened to trusted IP’s. In addition, the guest or home worker is likely to be behind their own firewall, and generally would not, or could not open control ports, TCP ports etc. With a public cloud VMR, everybody dials OUT. An organisation has no need to let any untrusted source through the firewall and onto the MCU. The guest dials out, you dial out, and meet in the middle in a VMR, all managed by dedicated specialists. (e.g. the VideoCloud 365 service is managed under ISO 27000 in a UK hosted datacentre, by specialists in Video Communication). Because a service in the cloud is managed by a service provider, an organisation has no need to buy a specified number of ports on an MCU. Or a limited ISDN gateway. Or specific space on a server. When more space is needed, you can buy more, when less space is needed, you can get rid -The cloud is a flexible source that provides organisations with what they need, when they need it. Features such as “cloud bursting” utilises a hybrid approach – use your on-premise equipment until you need more capacity, and then “burst into the cloud” when needed. Because a cloud service – like those from Lifesize, Cisco or VideoCentric’s own inhouse VMR services – are provided via a monthly subscription, there is no huge outgoing for an organisation upfront, and the cost can be spread over many months or years. This OpEx model allows organisations to be smarter with their spending, and recognise the ROI of a cloud service within the first few months. However, businesses do need to be beware of any hidden costs associated with some clouds. Video Conferencing Infrastructure and Video Collaboration networking is generally recognised as requiring specialist skills, especially for upgrades and maintenance of equipment. With equipment in the cloud, this service is provided as part of the OpEx model, and managed by the service provider, meaning IT staff can focus on inhouse needs and business strategy, rather than wasting time unplugging cables in server racks, and so on. Many organisations have a heavily congested network & firewall, and using a cloud based MCU enables an organisation to not congest the network even further, especially if communicating with those outside of the network. Bandwidth intensive video can be moved outside of the organisation, and become the responsibility of the service provider. In addition, a cloud solution is likely to have multiple points of presence, improving latency for international/remote conferences, and often joined via an MPLS network, meaning the highest quality and speed can be achieved. SHOULD WE KEEP OUR INFRASTRUCTURE PRIVATE? The promise of easy and cheap access to professional state-of-the-art solutions for organisations on a tight budget, without the need for expensive staff or grand integration projects has meant the uptake of cloud based solutions has seen a rapid incline. However aside from companies being cautious about cloud technology, many already have a great deal of on-premise infrastructure within their networks. 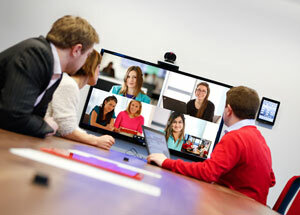 One of the leading reasons for organisations to stick with on-premise video conferencing, UC & collaboration solutions are the needs to comply with stringent regulations and data protection, specifically within the healthcare sector, financial services and large organisations, who may not put their trust in third party datacentres and service providers. Large organisations often have to abide by ISO 27000 standard for information security, and many cloud services can not meet these requirements. It is vital however to look at the facts and understand where security breaches are most common in organisations of your type and size. Some may be surprised as who they should actually be protecting their network from! Many organisations believe that bringing a third-party service provider into the equation provides another point of failure – something that can be deemed unacceptable to many large organisation who’s communications are mission critical to the business. It is likely that even if some large organisations recognise the benefits of cloud Virtual Meeting Spaces, and other cloud solutions, they will run these side-by-side as an add-on to their mission critical solutions. No matter how good the cloud is, and whether the service provider has achieved ISO 27000 security requirements, VideoCentric believe that many organisations would be better off with hosting a recording server on-premise. Risk is involved with recording conferences, and sensitive information is being stored, so to ensure recordings are not lost through transport, intercepted or damaged, a private on-premise solution should be considered. Speak to VideoCentric about our private hosted recording services, and other private recording solutions. There are many other considerations for moving into the cloud, staying on-premise, or utilising a hybrid approach, for example Cisco Spark with an on-premise PBX & call control, or on-premise MCU with a cloud-burst capability. If you’d like to discuss the your requirements further, have a chat with our specialists who can answer any questions you may have. With almost a decade offering Video-as-a-Service, VideoCentric have being providing a cloud video conferencing for longer than most Video Conferencing resellers have been in business! As an expert in video conferencing hardware and software solutions, alongside our extensive cloud knowledge, we can provide you with the unbiased information to help you choose whether to move into the cloud, invest in on-premise infrastructure, or create a solution that brings the best of both worlds together. VideoCentric’s VideoCloud provides a scalable and interoperable solution for business video collaboration, where one or many services can be brought together to build a cloud that exactly meets your needs. The VideoCloud has been designed for interoperability, and includes a range of Virtual Meeting Rooms, Network, Management, Recording and Collaboration services at your fingertips. Find out more about the VideoCloud below.